Free menstrual products will be available in bathrooms across campus starting Feb. 1. Dispensers will be located in both men’s and women’s bathrooms. Free menstrual products will be available in bathrooms in several Northwestern buildings by Feb. 1. The products will be distributed in temporary dispensers through a pilot program, which will run until mid-April, said SESP junior Sophia Etling, a member of College Feminists and Rainbow Alliance. Permanent dispensers will not be implemented until next academic year, provided that the pilot program is successful, Etling said. The menstrual products will be available in buildings on both Evanston and Chicago campuses. 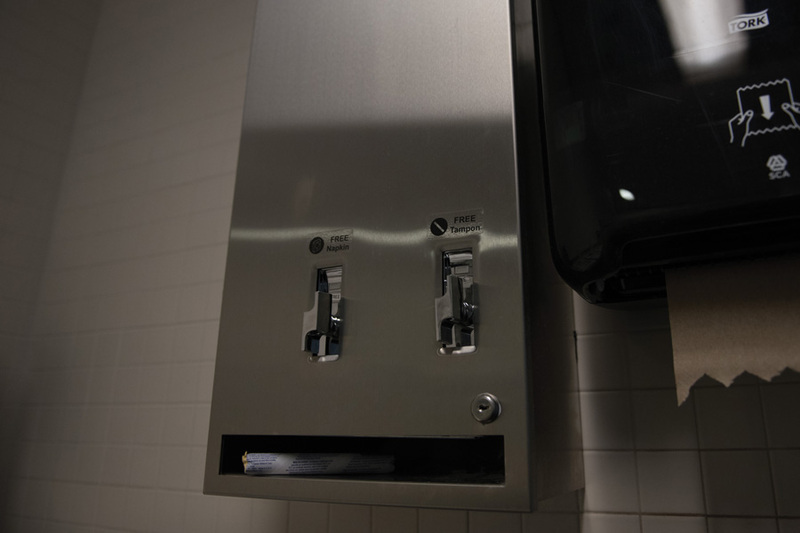 Free dispensers will be available in Kresge Hall, Pancoe Life Sciences Pavilion, University Library and the Facilities Management offices at 2020 Ridge Ave. On Northwestern’s Chicago campus, free menstrual products will be available in Wieboldt Hall. If the pilot program is successful, organizers hope to make menstrual products available in every Northwestern building, said Communication senior Amanda Odasz, outreach chair of Sexual Health and Assault Peer Educators. The program is the result of a collaboration between Northwestern Facilities Management and several campus organizations, including College Feminists, Rainbow Alliance, SHAPE and Associated Student Government, Odasz said. “We all have this common interest and we feel that the populations that we serve would benefit from this,” Odasz said. The program is also designed to be inclusive of transmasculine individuals who menstruate as well, Etling said. Free menstrual products will be available in both men’s and women’s bathrooms during the pilot program. In men’s restrooms, the products will be available in one stall to offer more privacy, Odasz said. Organizers will assess the cost effectiveness of the pilot on March 1 by examining the number of products taken and the number of instances of vandalism, Odasz said. Products are currently available through coin-operated dispensers, but they are often the target of theft and vandalism, she said. The program hopes making the products free will alleviate the issue. Christina Vernon Sanborn, associate vice president of Facilities Management, said organizers hope the program will be close to cost neutral due to a projected decrease in costs related to vandalism related to theft from coin banks in dispensers. Odasz said she hopes the initiative will not only help with students’ health on campus, but also destigmatize menstruation and remind campus that not all people who menstruate identify as female.